...and take advantage of all we have to offer with our Certified Dealership Program. "Absolutely horrible service from the service department. " Boyfriend just purchased our second vehicle from Forest City Mazda. Both time we have had nothing but the best service. Dan S (now manager) and Jesse F have been so helpful in getting us into a bigger vehicle as our family is expanding and need more room. When its time for me to upgrade my car I will be in to see these two. (Altho we didn't stay with Mazda and got a Dodge this time.) Thank you Dan and Jesse for the amazing customer service! The sales guy (Samir) did not know what he was talking about and was very insistent on trying to talk us into the car that we did not want. He could not answer basic questions that we asked him and had to constantly run to his manager. Then came the manager (Dan) to try to close us, and he kept talking about “dropping my pants”. He was trying to say let me knock off $300 on a $21000 car. I have less than $500 profit in the car. But it seems like he is too thick skulled to know about the internet, and all the wonderful information that it can provide a customer. Brought my 2013 Mazdaspeed 3 in for a engine light issue. Turned out to be something quick and easy. I was very satisfied with the service I got, my service advisor was great at keeping in contact with me throughout the three days my car was in and the technicians were amazing, very knowledgeable on their product and had no problem talking to me directly about it. Very honest staff and felt comfortable with my car being there. Very happy customer ! Thanks a lot guys ! Charlie made my experience there amazing, he’s a great sales man!! He cares about his customers and it really shows. Keep up the great work! "Things to avoid at the Dealership..."
Just picked up our new 2017 CX-5 which makes it our third new Mazda purchased from Probart in the last three years. During the last few years all servicing, winter / summer tire swap has been done at the dealership with no real issues. The Service department are a wonderful team - Tim, Joan and Ratko have been a real pleasure to deal with. Even when they are busy and rushed of their feet, they always go the extra mile - thank-you! 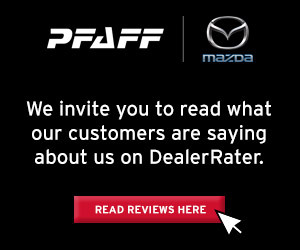 It’s the best experience by far for a car dealership Service department. Bob Lyons is our Salesperson who has sold us all three of our cars. It has always been a professional and smooth experience with non of the sales gimmicks experienced at other dealerships. Unfortunately, when purchasing my third car I was gently ushered into the Finance office yet again and was introduced to a lady named Eka, the Business Manager for the first time. This is the part were they try their best to up sell you on Rustproofing, Paint Protection, Extended Warranty, Interior Protection and even Sound Proofing. During each sales pitch for each product I kindly declined. This is because I get my own Rustproofing done yearly by a well known company in Ontario who have been around for years and begins with the letter ‘K’. The rustproofing she was trying to sell me for $500 + tax is a one time application and has a ten year warranty. I really find that hard to believe - what chemical product applied only once can withstand our Southern Ontario winters with all the salt and brine on our roads for ten years? Here’s a scary sales tactic used by her: “the small holes drilled into the car doors by rustproofing company ‘K’ can in fact void your warranty with Mazda Canada and also your car insurance”. My Insurance company has never heard of such a thing and Mazda Canada declined that statement and confirmed that it does not. I guess she’s not aware that the car already comes with two holes drilled into each door by Mazda from their factory! Being a Business Manager I guess that might be just a tad too technical for her. By the way, I had contacted ‘Mazda Canada’ prior and the funny thing is they do not even recommend rustproofing their vehicles! Here's a quote from a reputable website about rustproofing at dealerships: What To Avoid:- "There are other types of rust protection on the market other than oil based products. Many dealers will offer a one-time undercoating for a fee of $500 or more. There are also some electricity based products that keep a live current going through the metal in your car that is supposed to prevent rust. Everything I’ve read indicates that these types of rust protection are inferior and should be avoided. Undercoatings in particular can actually cause rust if they crack or are applied incorrectly allowing water and salt to get trapped between the coating and the metal causing it to rust faster." I was then told that for $500 + tax I could get a Diamond Kote Paint Protection, which will remain and protect the car paint for five years! I’ve already had DK put onto my first car purchased at Probart and it definitely did not last more than a year. If you contact any professional car detailer (which I did) and ask a few basic questions regarding Diamond Kote or any other paint protection they will tell you the correct information and remember they specialize in detailing! ( One of the best places for professional car detailing and vehicle services is in downtown London opposite Via Rail ). I was told that the paint protection process would take about two hours to apply to the car. Any professional detailer out there knows that this is a physically impossible time frame, as certain steps and processes have to be carried out in order to prep the paintwork. But hey $500 for paint protection which probably only costs around $30 for the bottle sounds like a real bargain! Now time for the Mazda WearCare warranty at around $1300. A nice glossy brochure which looks really nice. After asking her if I could see and read the ‘terms and conditions’, her answer was “no - you have to purchase the coverage first”, only then can you read the ‘terms and conditions’. Here’s one of the reasons why - in the nice glossy brochure you are told that they fix ‘scratches and dents’ on your car, just bring it in no problem. What they don’t tell you is that horizontal panels are not covered, only vertical panels! So basically if you get a dent / scratch on the hood, roof or tailgate, it’s not covered - period! Why was she not upfront about this for a $1300 package? During my time in her office the mood changed dramatically and I sensed frustration, arrogance and her tone voice had become abrupt and very cold - the warm friendly customer service was nowhere in sight, especially when this was the third car I was purchasing from Probart. To all potential customers - please do some research before entering the Finance office at a dealership. From rustproofing, paint protection, extended warranty and even things like window tinting, you can save yourself literally $1000’s if you just spend some time doing a little research. Also, remember that their ‘add-on’ prices are always negotiable and you will be surprised just how fast they drop the price if they really want your money or should I say ‘fleece’ you without you knowing! Just a disappointing experience to what has been a wonderful experience at Probart so far.